Elastech Solutions Inc – What are rubber grommets? When you drill or punch a hole in metal or other substrates, you create sharp edges that can be a hazard to materials that may need to be run through those holes. Often these holes are necessary for wiring, piping, hoses, rope, air lines or other elements that are integral to performance. These elements need to be protected against the sharp edges of the holes they are threaded through in order to guarantee continued operation. This is where rubber grommets come in. Rubber grommets are flexible pieces, collared to keep them in place within a hole. The rubber ring creates a mechanical buffer between the metal and the other component. This prevents the component from rubbing against the metal and wearing through, causing shorts or leaks and creating malfunctions. The grommets are also able to prevent the grounding of electrical wire when it is passing through metal components. Aside from protecting components from cuts and rubbing, rubber grommets are also used as vibration dampeners, creating a snug fit between two different components. These types of vibration mount grommets protect against compression forces, and also help to reduce noise levels. These types of grommets are easy to tell apart – they always have one rib thicker than the other, and it is this thickness that provides stability and vibration isolation. Grommets with extended necks, meanwhile, are often used on electrical appliances where the wire enters a unit, with the neck providing some extra stability for the wiring. Rubber grommets are also great for spacing components apart, with multiple component holes to pass different components through the same hole in the substrate, yet preventing the different components from coming into contact or getting intertwined. Finally, grommets help to create a finished appearance, particularly in furniture applications. A properly sized rubber grommet will be easy to position, and should snap firmly into the panel hole. They can be sized to fit all types of holes and all types of components, with varying inner and outer diameters and groove widths. A properly sized grommet will provide protection for other components aside from the one that is being threaded through the interior – particularly in electrical applications, the grommet helps to seal gaps and prevent air, water, and dirt from making its way through the hole and having an effect on the wiring or other components. Rubber grommets can be made from a variety of rubber compounds, depending on the specifications needed, ranging from silicone to Buna-N. This allows for varying levels of hardness to cope with different substrates, depending on the stress levels that are expected. Specially formulated compounds can also be used to combat excessive heat and fungus, if necessary. The highest-specification materials are also resistant to oil and ultraviolet rays, and provide the best protection for sensitive components. Rubber grommets are not exclusively circular either. Because of the method of production, the rubber can be molded to fit odd shapes, including ovals, squares, or squared-off circles. Rubber grommets are resistant to tearing and abrasion, rust, and corrosion, making them quality long-term solutions. 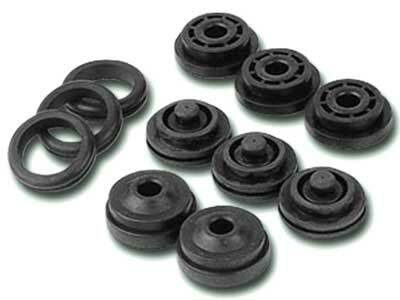 Elastech Solutions can meet your requirements for rubber grommets. We provide a wide range of grommets to fit your particular needs, with a variety of stock parts as well as the ability to create custom rubber grommets per your specifications. Our sales personnel can be reached at 866-895-8772, or by e-mail sales@elastechsolutions.com, and can help guide you through picking the right materials and designs to make sure your project meets expectations.